The Al Asad air force base was the most important hub for commercial and cargo transportation and supplies during Operation Iraqi Freedom. Image courtesy of US Air Force. 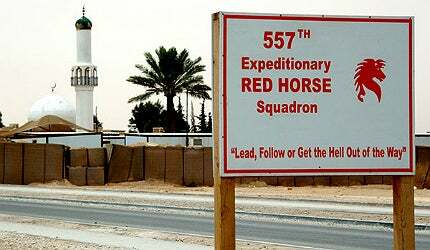 The 557th Red Horse Squadron at the Al Asad airbase was responsible for supporting Coalition Forces in the region. Image courtesy of Capt. Ken Hall, US Air Force. Al Asad currently serves as the headquarters for the 7th Division of the Iraqi Army. Image courtesy of Capt. Ken Hall, US Air Force. The air force base facilitates movement of large aircraft such as C-5 Galaxy and Boeing 747. Image courtesy of Capt. Ken Hall, US Air Force. The airbase has two runways, hangars and taxiways. Image courtesy of Capt. Ken Hall, US Air Force. Al Asad air force base is located in the province of Al Anbar in Iraq. It is situated approximately 180km west of Baghdad. It was the largest coalition base in western Iraq and the second largest US air force base in the country during Operation Iraqi Freedom / New Dawn. The airbase was handed over to the Iraqi Government in December 2011. It is currently the headquarters of 7th Division of the Iraqi Army and has an infantry school. The air force base served as the most important hub for the supply of fuel and military trucks convoy during Operation Iraqi Freedom. It is also the most air accessible and commercial air service base in Iraq, enhancing its prominence. "The Al Asad airbase, previously known as Qadisiyah Airbase, was built in the 1980s with funding from what was then Yugoslavia." The Al Asad airbase, previously known as Qadisiyah Airbase, was built in the 1980s with funding from what was then Yugoslavia. The base was named after the Battle of al-Qādisiyyah in 636. It was operated by the Iraqi Air Forces (IQAF) until the 1990s. It was then home to a three square kilometre Weapon Storage Area (WSA). The base was operated by three fighter squadrons of the Iraqi Air Force operating Mikoyan-Gurevich MiG 21s and MiG 25s. The airbase was seized by the Australian Special Air Service Regiment in April 2003 and handed over to the USAF in May of that year. It was captured with about 50 fighter war planes, including the MiG-25s and other explosive ordnance. It has several aircraft hangars, bunkers, a modern hospital and 33 hardened aircraft shelters (trapezoids). The airfields were refurbished by the 3rd Cavalry Regiment of the US to allow the landing of large transport and fuel supply aircraft. Some of the trapezoids were renovated for use as offices, along with the hospital, by the USAF and coalition troops. The airbase has a perimeter of about 24km. It lies 12km from the Euphrates river and is divided by a valley. "The forward operating airbase was home to the II Marine Expeditionary Force." The living, military vehicles and administrative areas lie in the dry valley area. Runways, hangars and taxiways are located on the southern side of the base. A joint venture between Berger and Cummins built a 35MW on-base power plant in 2008. The JV also constructed underground power distribution facilities at the airbase in May 2010. TS2 Satellite Technologies was the internet provider. The base also has a drinking water bottling plant which uses reverse osmosis technology. The forward operating airbase was home to the II Marine Expeditionary Force. Major tenants included the USAF, Base Command Group, Regimental Combat Team 2, Electronic Attack Squadron 142 (VAQ-142), the 82nd Airborne Advise and Assist Brigade, 507th Corps Support Group, Navy Customs Battalion Juliet, 32nd multifunctional medical battalion (MMB) Forward Distribution Team, 321st Sustainment Brigade, Vertical Onboard Delivery Detachment (VOD-1) and Marine Wing Support Groups. It also accommodated the US Navy Construction Battalions (Seabees). The 532nd Expeditionary Operations Support Squadron (EOSS) provided all the command and control and logistics support for the USAF, as well as passenger and cargo transportation at the airbase. The airbase has two runways measuring 14,000ft and 13,000ft, along with multiple taxiways. The runways were reconstructed to fill the craters by the Naval Mobile Construction Battalion (23 and 24) from October 2004 to March 2005. The existing permanent air traffic control tower was prepared for operations in September 2004. The 150ft tall, all-weather tower offers greater visibility and other modern benefits, such as radar coverage and tactical air defence controllers. The air facilities allow movement of larger aircraft, such as C-5 Galaxy and Boeing 747. The airbase is secluded due to the surrounding desert, rocks and scrublands which prevents the attacks. It is protected by a 21km security perimeter. The security measures include security towers, barbed wire and a bridge to cross the wadi. Marine Wing Support Squadron 271 enhanced the security at the airbase by extending the perimeter mesa fence, in June 2005. Several Ugandan soldiers are deployed by the Coalition Commander for providing security at the gymnasium, PX and morale support facilities. New air conditioned trailer container type housing facilities, living areas, a large Post Exchange (PX), morale, welfare and recreation centre, a theatre, an indoor swimming pool, gymnasiums, dining facilities, a telephone centre and an internet café were established at the base by 2006.